The first page of Coutoo (see Figure 1) appears as a singularly disconcerting incipit(11). The first reading leads one to notice an opposition between the scene at the top of the page and the one in the last panel. Characters and places differ: we do not know how to integrate the space in the last panel with Pestrone's apartment. Two cultural frames are also present: Italian-western (the paradigm of violent jealousy punctuated with Maa, Basta...) combined with an odd mix of traditional Africa and modernist settings (the circle of fetishes, Toby-Toby's clothes, and the architecture). But this juxtaposition, already intriguing in itself, becomes definitely disturbing as soon as the two universes have to be seen as interconnected: the character at the bottom continues the rejoinders of the one at the top! Moreover, all the principles of composition used on this page inescapably lead us to this inconceivable confrontation. 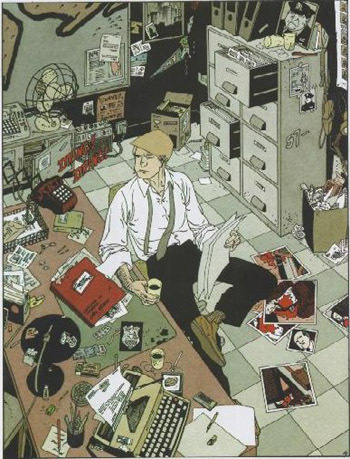 The Toby-Toby character, in the large panel, has some characteristics in common with Gina above him: sitting like her, in frontal position, he is perfectly aligned with the panels in which she is shown. 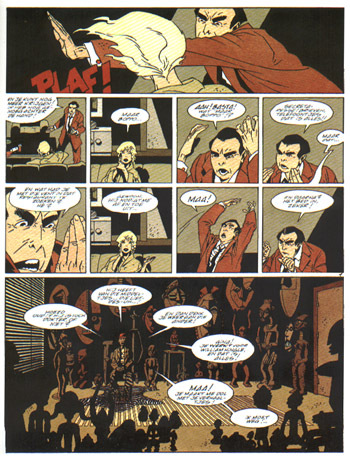 Moreover, Pestrone's dance of gestures and words, which literally surrounds the "column" formed by Gina's two panels, seems to recur in the last panel, with the displaying of balloons around Toby-Toby. As to the text, the interconnection of the two scenes assured by the continuity of the dialogue from one scene to the other is intensified by a very felicitous slip of the tongue. As a whole, Pestrone's angry speech is relatively precise: he states, orders, interrupts, gives information, expects answers, challenges, interprets; but one retort stands out because he hesitates, "There's aphro...somethin' 'r others!" This wavering in the flow and the vague meaning (something, others) makes a phonetic jump possible from "aphro" (aphrodisiac) to "afro" (African), i.e., a double meaning that allows the two signifiés to be part of the universes of both the first and second scene. Moreover, this balloon is perfectly aligned with Toby-Toby's vertical axis, in the "column-space" which runs across and unites the two scenes(12). Thus, the opening page of Coutoo has a similar impact as some of Escher's most popular patterns (Samson, 1987:11), in which the fantastic effect stems from the confrontation between the codes of realism and the "irreality principle" of an "improbable totality" (Bessière, 1974). Confusing the reader in Coutoo's opening(13) represents more than a simple surprise effect: his first attempts of building a reality with the current codes of probability will be proven ineffective(14). Moreover, far from clearing up a misunderstanding, the next pages do nothing but increase this feeling of confusion: on the second page, Toby-Toby becomes the bearer of an additional voice, but it is especially the third page (see Figure 2) which serves to confuse the reader even more. From the outset, this page makes a complete formal split from the first two pages. The chromatism and the typography are radically different. The verbal elements change from dialogue to narrative. Moreover, the regular format of the panels and the recurring space, represented consistently from the same angle, are in opposition to the changing point of view which characterized the first two pages. In addition to these formal differences with the preceding pages, the third page also organizes a systematic game of jumps in the reading action. The first-person narrative mode may, during the reading of the first few panels, give the illusion that the only represented character is the bearer of these thoughts: this illusion is broken in the sixth panel where he is referred to with "Like this guy!" The fixed point of view and the movement of the victim-to-be towards the front of the stage can lead us to assume that the classic aggressor's point of view in a situation of suspense is represented (see Figure 2). This idea dissipates in thin air in the last panel, when the aggression comes from an unexpected angle. At this moment, the reader may infer from the narrative in the previous panel ("I can imagine the sound") that, rather than a "directly shown perspective," a reconstruction of reality by another character is presented. More precisely, the reader is shown how a character--the reader of the file (page 4)--reconstructs the way another actor has reconstructed a scene he has never been part of! Additionally, at this moment in the reading process, it becomes almost impossible to integrate this new information with the parts of the story already suggested in the first two pages. With Coutoo, this essentially fantastic motif is made particularly effective through the sophisticated use of this narrative system. By using the possibilities of a mode of expression suited to the comic strip, Andreas confronts us with situations of improbable juxtapositions and successive dislocations in the narrative.